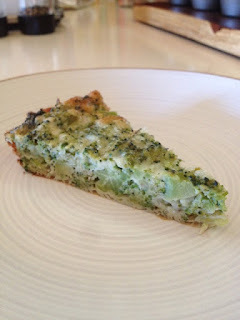 This recipe is a zucchini version of my Broccoli Pie. This recipe was adapted from this recipe from Megan at The Detoxinista. 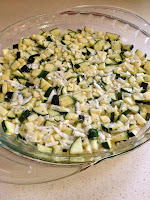 3 cups zucchini shredded (about 2 zucchini) **This tip came from Megan at The Detoxinista: squeeze out the water from the zucchini it really helps the finished product to not be too wet! *If you are dairy free, I think Daiya shreds would work fine in this. I have not tried it so if you do this with Daiya, please leave a comment so we know! Beat eggs in bowl, add cheese, baking soda, salt, pepper, parsley and garlic powder. Mix until combined. 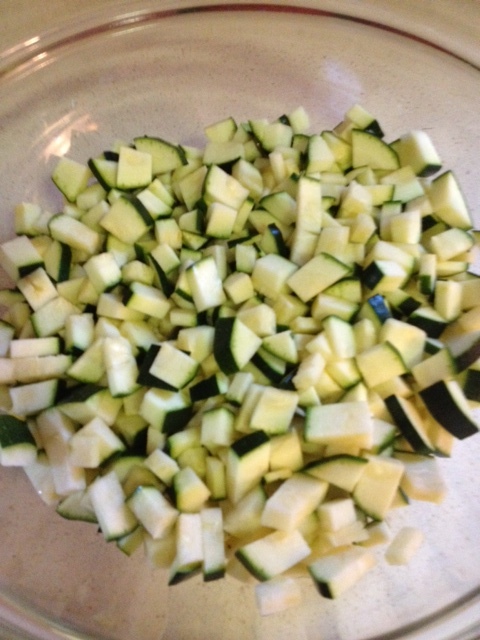 Fold in Zucchini until coated. Grease a muffin pan with olive oil and pour mixture in about 2/3 full. Bake at 350 for about 20 minutes until lightly browned. Grease a 9 inch pie plate with olive oil. 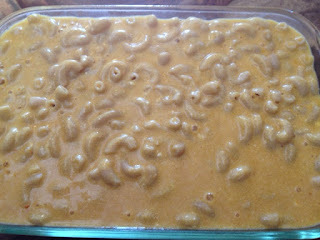 Pour mixture into greased baking dish and bake at 350 degrees for about 30 minutes until lightly browned. 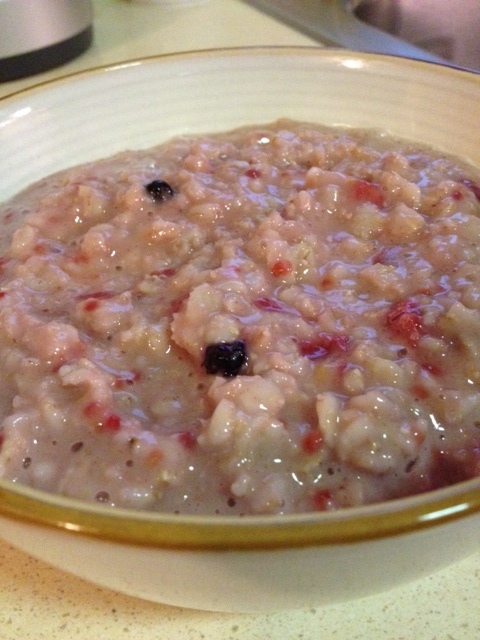 One of my favorite breakfasts is oatmeal, it is filling and very healthy. If you are gluten free, make sure you are buying gluten free oats (I use Bob's Red Mill GF Oats). I am very happy that my kids also love oatmeal. I add different types of fruits, nuts, honey, maple syrup, and spices to change the flavor but this “oatmeal cookie” flavor seems to be their favorite! Cook oats on stove top according to directions with the raisins. Add the cinnamon and the honey. Most of us look at the front of a package and expect that the information that is important is there. In most cases this is not true. You really need to read all your ingredients to know whether or not a food should be purchased or put right back on the shelf! I get a lot of people ask me how do I food shop with so many criteria to go by. Once you know the key items to avoid it is a lot easier to quickly glance at a label and know if it is something you should be eating or not. This goes for everyone whether you have food sensitivities or not. Obviously if you are allergic to something or have a sensitivity to something, you need to add that to your individual lists. Here are some tips to help you navigate through the grocery store and feel a little less overwhelmed! 1. You should know what everything means, If any ingredient has a chemical-sounding name, avoid it. Sorghum Flour, Date Paste, Grape, Apple and Pear Juice Concentrates, Brown Pure Cane Sugar, Expeller Pressed Safflower and/or Sunflower oil, Rice Dextrin, Ground Flaxseed, Water, Xanthan Gum, Baking Soda, Vanilla, Salt, Cinnamon, Rosemary Extract. This is an acceptable list of ingredients. 2. Ingredient lists don’t have to list chemical contaminants. Pesticides and other toxic chemicals will be there and not be listed on the label. Buy Organic and fresh as much as possible! 3. Whole Grain is healthier. Look for the words “whole grain”. Don’t be fooled by multi-grain or “made with whole grains”. If it just says wheat, it can be processed white wheat flour. This “white” flour has no nutrition, it has been removed. 4. Brown Eggs or not healthier than white eggs, you should buy organic eggs either white or brown. 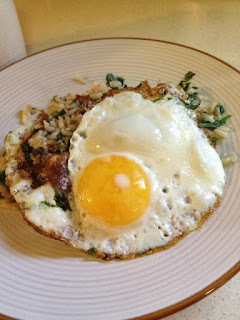 If there is a local farm near you that you can get your eggs from, that is best. 5. Look at your serving sizes. Someone recently joked with me about counting food before packing it for myself or my family. I always read the labels. Especially on treats, if you going to have a treat have one serving. Sometimes you can easily eat up to three times the amount of a serving of food if you don’t know what the serving size is! 6. Avoid the words, Hydrogenated and partially hydrogenated, High Fructose Corn Syrup, Bleached, Artificially flavored (even if it says naturally and artificially flavored! ), All food coloring (red 40, blue 2…etc) only used natural colorings from beets and other fruits and veggies. 7. The word natural means nothing right now. You have to read the ingredients yourself! I recently read a label that said natural and contained high fructose corn syrup. I also recently turned down a baby product because although it was called natural it had parabens in it! Don’t buy something because it says natural only make sure the ingredients meet your standards! 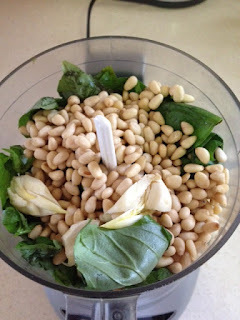 My daughter loves beans any kind, black, cannellini, pinto, she loves them all. I am so happy that she does because they are so good for you. My son, on the other hand, spits them out. He seems to dislike the skin on them. So, while all I can do is hope that this is a phase he grows out of, being who I am, I must try to find ways to sneak them into his diet! 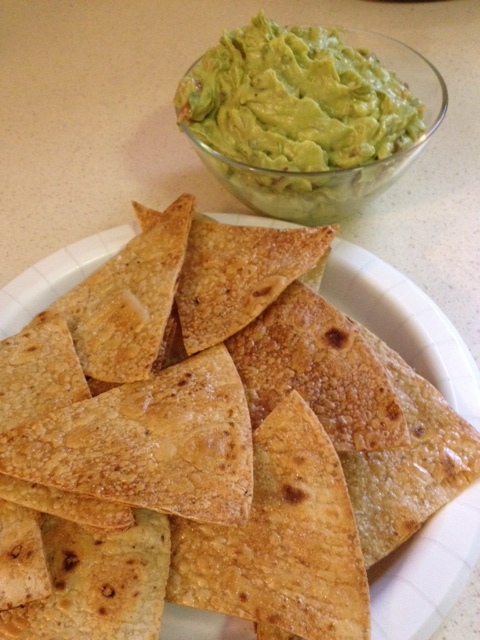 Since he loves to dip, I figured I’d make him a bean dip. I also hid a veggie in there! 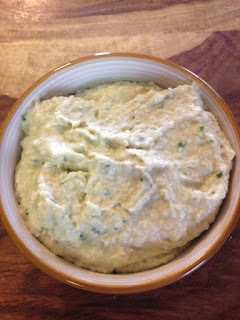 I came up with this white bean and artichoke dip, it looks very neutral so he didn’t suspect anything. I was very pleased when he ate this and asked for seconds! I recommend trying this for any kids who don’t like beans. Now I will experiment with other beans to see how many different kinds I can get him to try. I will keep you all posted! Place all ingredients in a food processor except for olive oil and process until smooth. Drizzle in the olive oil and continue to blend until incorporated. Serve with your favorite crackers, pitas or veggies to dip! 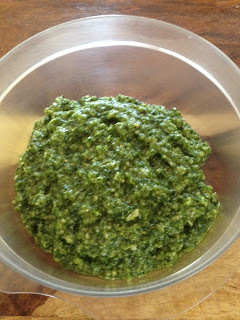 Pesto is one of my favorite pasta sauces. After going gluten free, I was very happy to be still enjoy pesto on my gluten free pasta. 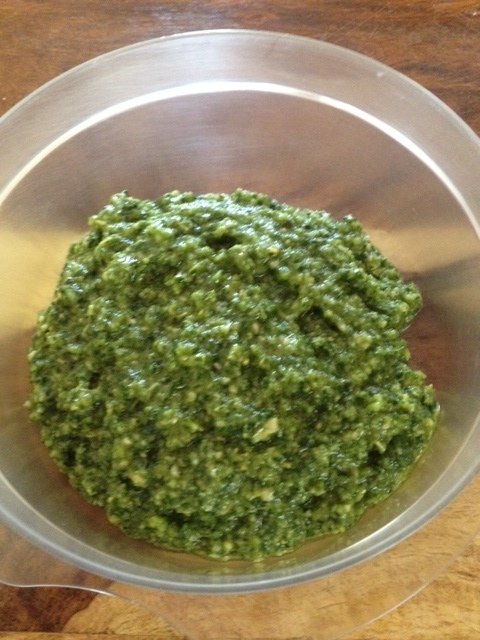 Now that I’m cutting down on dairy, I went to make pesto and thought….how will it work without the parmesan??? Pesto without parmesan wouldn’t taste the same, but I had to figure something out. I started by just removing the parmesan and seeing what happened. To my surprise, it wasn’t too different at all. After a few adjustments on the amount of salt and olive oil, I came out with a completely satisfying parmesan free pesto!! I hope you enjoy! Combine all ingredients in a food processor and process until smooth. Serve on your favorite pasta or use as a spread on crackers. Heat the oil in a large pan over medium low heat. Add the onion and garlic and saute until translucent, about 5 minutes. 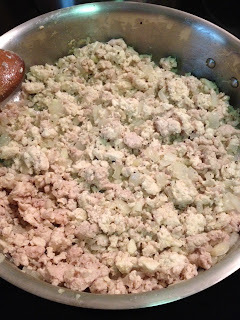 Add the ground turkey and cook until no longer pink. Add the marinara sauce. Cook for 15 minutes, stirring occasionally. Season the sauce, to taste, with salt and pepper. Cook the spaghetti in a large pot of boiling salted water until just tender, stirring often. 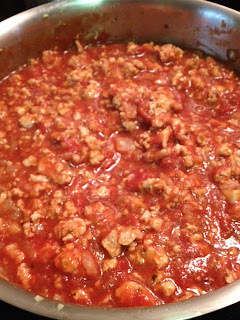 Drain and rinse the pasta and add the pasta to the sauce and toss to coat. 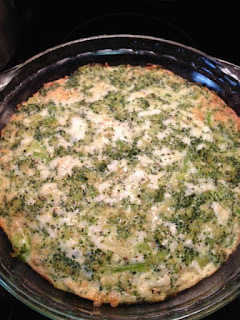 This Recipe was adapted from The Simple Art of Eating Well, it has been made Gluten Free and Dairy Free and I changed some of the spices. Wisk milk, vinegar, mustard, garlic and hot sauce in a glass bowl until combined. Add chicken and turn to coat. 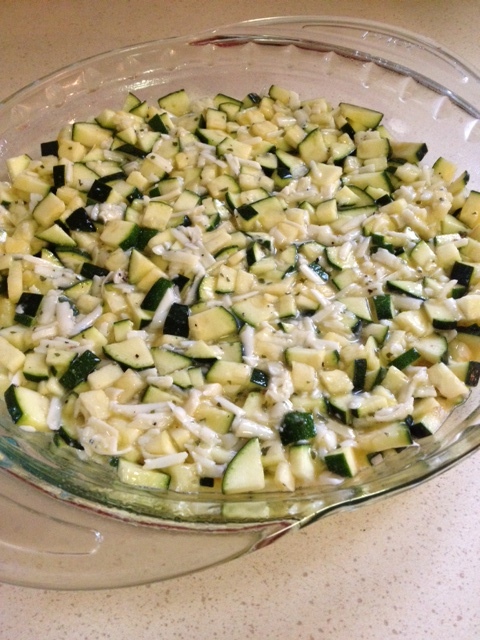 Cover and marinate in the refrigerator for at least 1 hour or up to 8 hours. Preheat oven to 425 degrees. Line a baking sheet with foil and spray with olive oil spray. Combine flour, cayenne, baking powder, salt and pepper in a sealable bag. 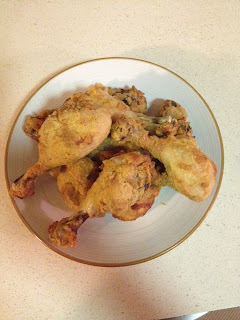 Place chicken in the bag two at a time and shake to coat. Tap off excess flour and place on the prepared baking sheet. Spray the tops of the chicken with olive oil cooking spray. Bake the chicken for about 45 minutes, until no longer pink in the center. Rinse the salmon and pat dry with paper towels. Cut the fish into piecesabout 1/2 by 1/2 by 3 inches in size. Place the eggs in a bowl and beat. Put the bread crumbs in another bowl. 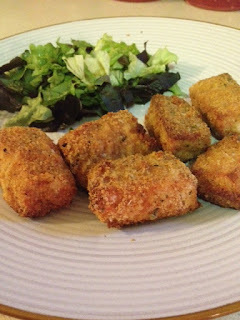 Dip the salmon in the eggs and then into the Bread Crumbs. Place the breaded salmon pieces on an oiled baking sheet. Spray tops with olive oil spray. 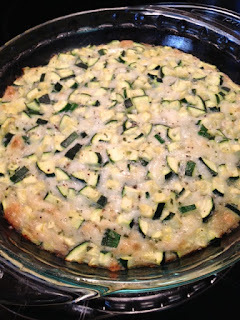 I am always looking for new ways to get my kids to eat more veggies. This is one way that works, I make this in muffin tins for the kids and it's a quick breakfast when we are short on time. You can also make this in a 9 inch pie plate to cut up and serve as slices. 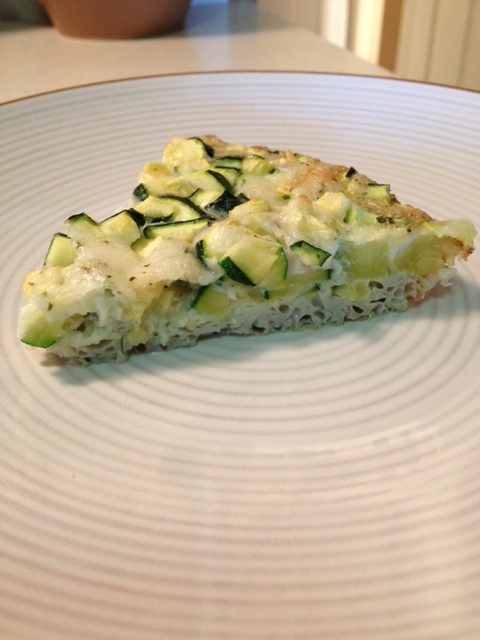 This recipe was adapted from this recipe from Megan at The Detoxinista. If you are dairy free, I think Daiya shreds would work fine in this. I have not tried it so if you do this with Daiya, please leave a comment so we know! 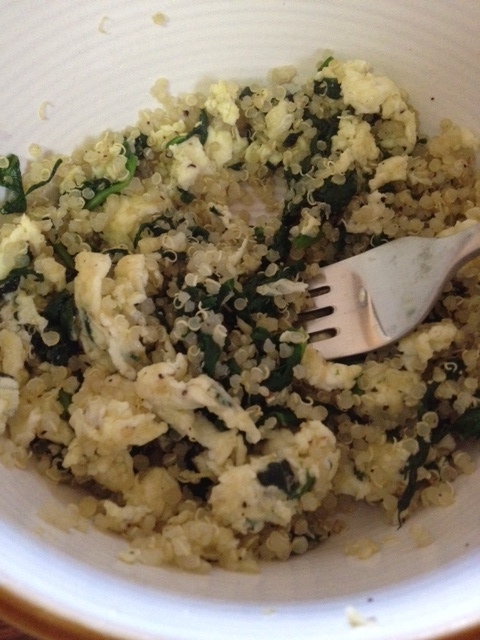 Beat eggs in bowl, add cheese, baking soda, salt, pepper, parsley and garlic powder. Mix until combined. Fold in broccoli until coated. Heat the oil in large pot or Dutch oven over moderate heat. Add the onion, bell pepper and garlic, cover and cook, stirring occasionally until the vegetables are soft, about 10 minutes. Add the ground turkey, breaking up the meat with a spoon, until the meat is no longer pink. 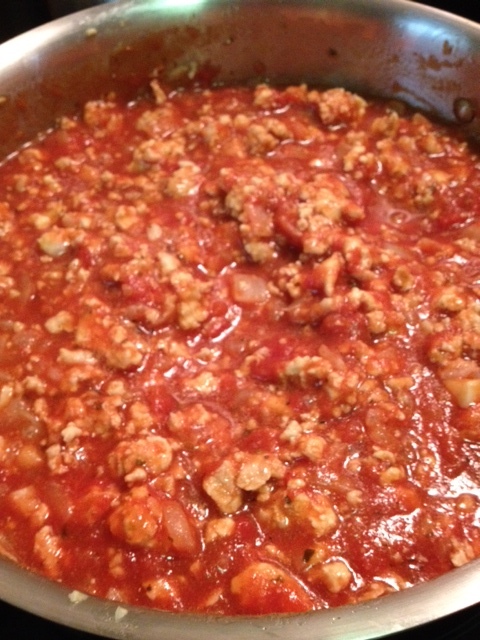 Stir in the tomatoes, tomato paste, stock, pepper flakes, oregano, chili powder, salt and pepper. Simmer, partially covered, stirring occasionally, for 30 minutes. Stir in the beans and cook, partially covered, 20 minutes longer. Preheat the oven to 375 degrees. Coat a 9 by 13-inch baking pan with cooking spray. Bring a large pot of water to a boil. 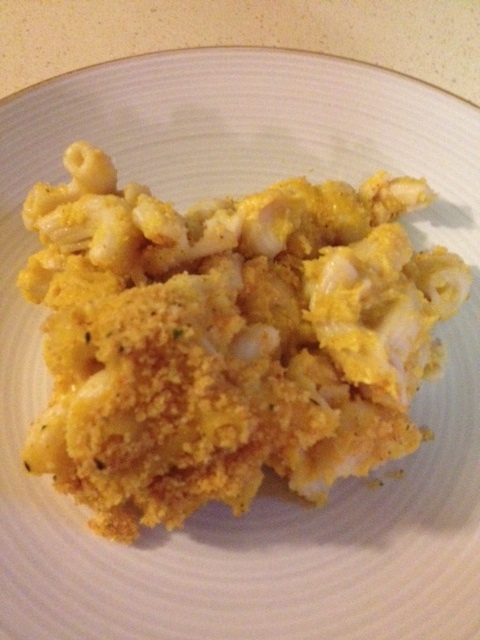 Add the macaroni and cook until tender but firm. Drain and transfer to a large bowl. 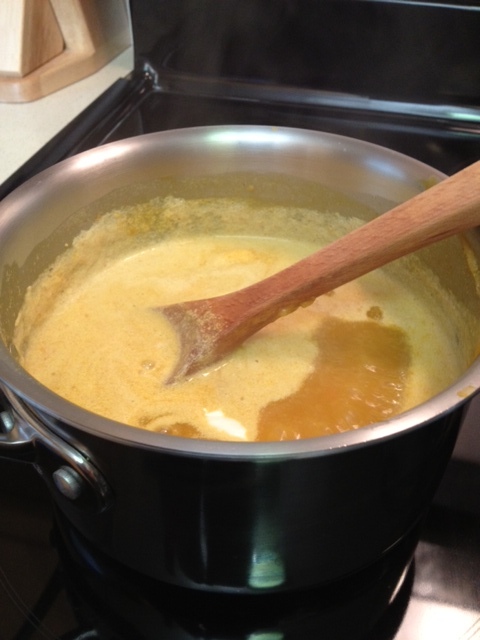 Place the pumpkin and milk into a large saucepan and cook over a low heat, stirring occasionally. Turn the heat up to medium and cook until the mixture is almost simmering, stirring occasionally. 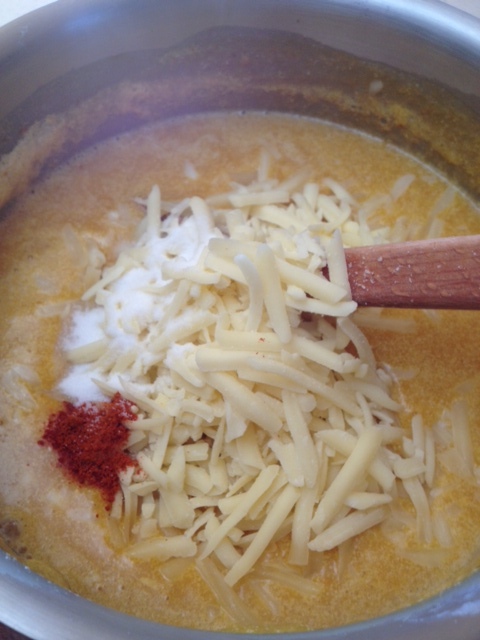 Remove the pan from heat and stir in the cheese, yogurt, salt and cayenne pepper. Pour cheese mixture over the macaroni and stir to combine. Transfer to a baking dish. Combine bread crumbs, Parmesan cheese and olive oil in a small bowl. 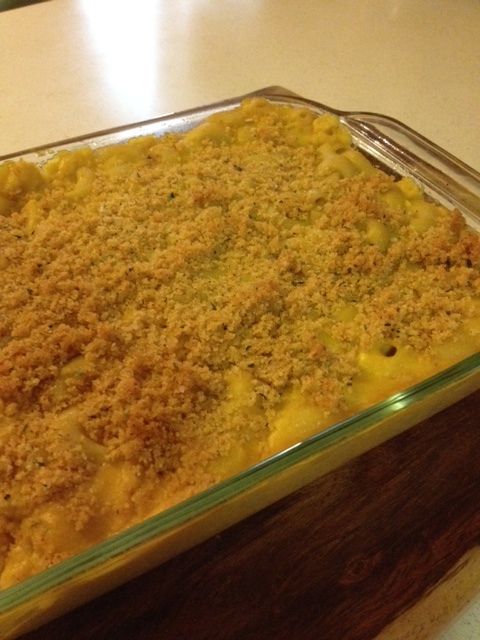 Sprinkle over the top of the macaroni and cheese. Bake for 20 minutes until golden brown. If you want it extra crispy on the top, put in under the broiler for 2-3 minutes. What better way to celebrate Father’s day than a family BBQ with yummy food that is good for you! I love salads especially in the summertime, but I get tired of the same salads over and over again. 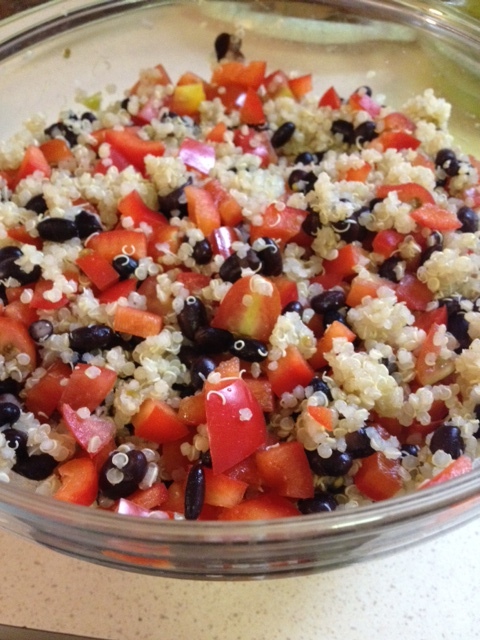 This salad combines two of my favorite foods, black beans and Quinoa! This is a very healthy, nutrient packed salad that can be enjoyed throughout the year, but is especially good at BBQ season. 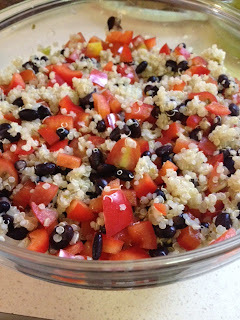 This recipe was adapted from this Williams Sonoma Black Bean Corn and Quinoa Salad. I made a few adjustments to the dressing and the ingredients in the salad, I hope you all have a wonderful Father’s Day! Combine all dressing ingredients in a bowl and whisk together. Set aside. Combine remaining ingredients in a large bowl and toss together. Drizzle dressing over bean mixture and mix until thoroughly combined. Enjoy! 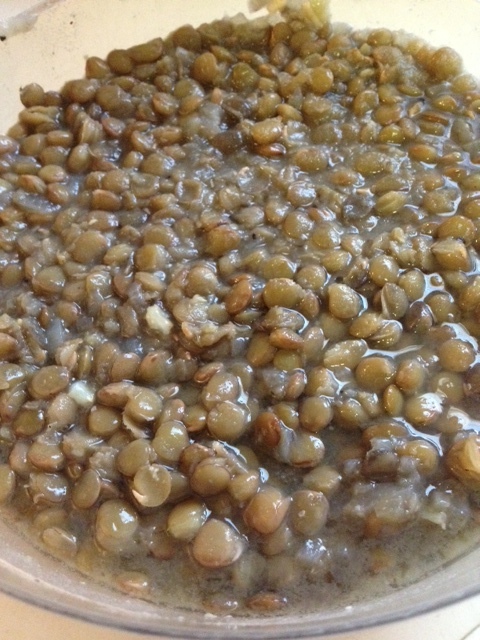 I love Lentils, they are delicious and very good for you! 1/2 a cup of cooked lentils has about 9 grams of protein and 8 grams of fiber! Sometimes cooking dried beans can take some time, but lentils cook very quickly and this dish is done in about an hour and a half with minimal work, so it is a great dish to make and keep in the fridge so you have them ready to go for lunch or dinner. Just a scoop on top of your salad and you have a great meal! In a medium pot, add the rinsed lentils, olive oil, onion, garlic, stock, salt and pepper. Bring to a boil then cover with lid slightly lifted to allow steam out. Reduce heat to simmer and cook for about 1 1/2 hours until lentils are tender. Ladle lentil mixture over cooked brown rice or salad. In a pan, heat the butter of your choice. 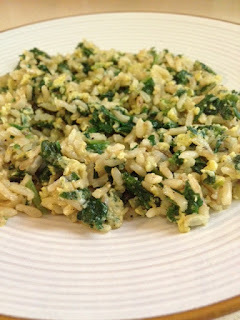 Add the spinach and cook until softened. Add salt and pepper. 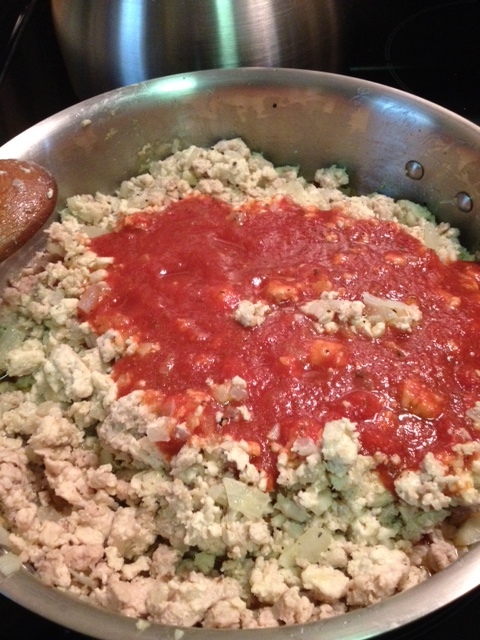 Add the cooked Quinoa and cook until heated through. 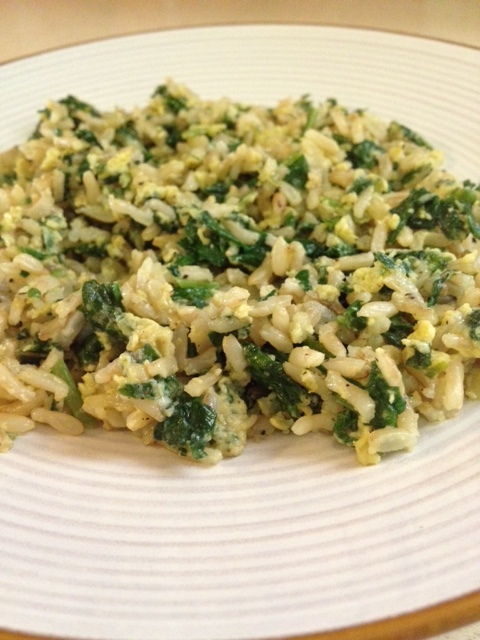 Scramble your egg in a bowl then pour them over the spinach mixture and cook for another couple of minutes until the egg is cooked. Enjoy! Anyone who has kids that are gluten free know that birthday parties can be a little difficult if you don’t bring your own stuff. It is usually pizza and cake. I use to bring a cookie or muffin or something that I had made for my daughter to have while the other kids had cake. Recently she started to ask me to make her a cake so she can have icing and sprinkles too! I never want her to feel left out and although I don’t believe in eating a ton of sweets, I don’t want her to feel like she can’t participate. Now I had to decide what to do! Do I bake an entire cake and cut a slice for the party?? 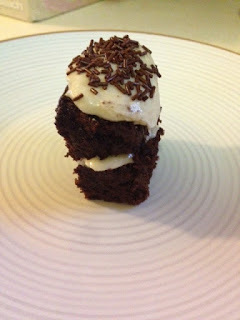 Then I looked in my freezer and I had Joan's Double Chocolate Muffins so I went to work and here is what I came up with! Kids are happy and I’m happy because it didn't take a lot of work! Cut muffin in half (do this while still slightly frozen). Then cut in half again and ice in between layers and on top. See below for icing recipe! Then top with sprinkles! Store in the refrigerator until ready to go. Blend with hand blender in a small bowl. 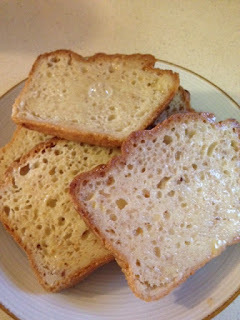 If it doesn't seem firm enough add more sugar a few tablespoons at a time until it is firm. 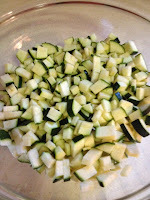 This will make more than you need so you can either cut in half or store the rest in the refrigerator for up to a week. Once in a while I really get in the mood for a crunchy snack. Being gluten free, that usually means some gluten free pretzels, corn chips or potato chips. I am not a fan of those, because they are mostly empty calories. When I saw these chips for the first time, I was impressed with the nutrition and also the taste. Once my kids started to have them, now that’s all they ask for when they want a crunchy snack. Although my daughter loves beans and would eat them every day, my son doesn't like the texture of beans. He really loved these bean chips though!! The other thing I really love about them, is that they really make you feel full and one serving is more than enough, unlike some chips where even 2 servings leaves you still hungry! Recently these were also featured on Dr. Oz. 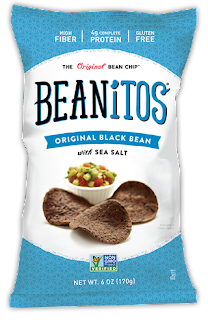 Go to Beanitos web site to order or you can find them in local health food stores. These are also corn free, gluten, wheat and soy free, high fiber, low glycemic, cholesterol and trans fat free, Non-GMO and Kosher and have 4g complete protein! 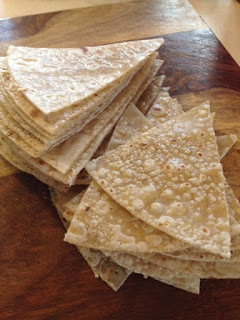 I know there are many recipes out there for brown rice tortilla chips, this is my version and it is very simple to prepare. 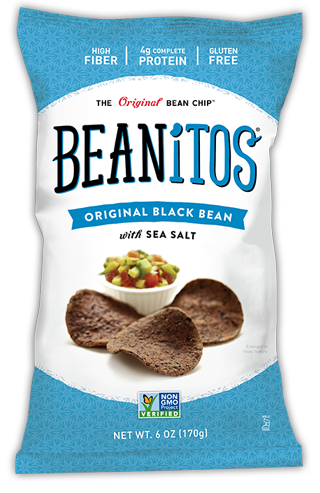 If your avoiding corn and wheat, these are a great option for a healthy chip that is corn, soy, gluten and dairy free! They are perfect to eat on their own or in your favorite dips! 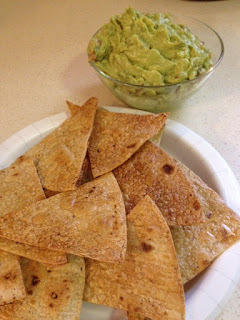 My personal favorite is guacamole (recipe below). Preheat oven to 400 degrees. Spray 2 baking sheets with Olive oil spray. Cut brown rice tortillas (I get mine in Trader Joes) in eights and lay them on the sheets. 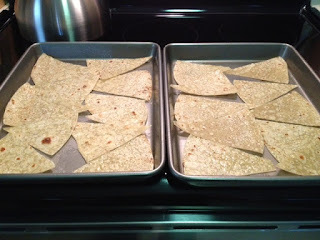 Spray the tops of the tortillas with olive oil spray. Put in the oven for 6-9 minutes, until golden brown. Keep an eye on them in the last two minutes, because they can burn quickly. Sprinkle with sea salt. (you can also sprinkle with cayenne, garlic powder, rosemary or any other spice you like for a different flavor). Serve with your favorite Dip. In a medium bowl, mash avocados with a fork or potato masher. Add the red onion, juice of 1 lime, tomato, cilantro, salt and pepper. Mixwell. If you like it a little spicy, add a few drops of hot sauce to you bowl and mix. Boil water and add oats reduce to simmer and cook for about 15 minutes. Remove from the heat and Stir in your berries, cinnamon and stevia. Add your almond milk until creamy. In a pan, heat the butter of your choice. 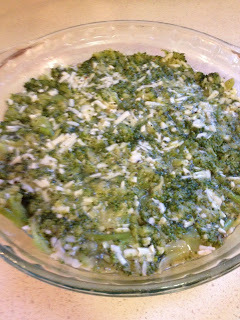 Add the kale and garlic cloves and cook until softened. Add salt and pepper. 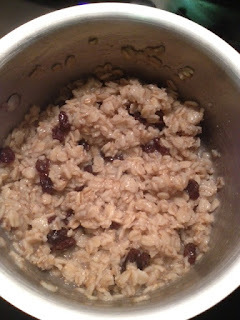 Add the cooked brown rice until heated through. Scramble your eggs in a bowl then pour them over the kale mixture and cook for another couple of minutes until the eggs are cooked. Enjoy! 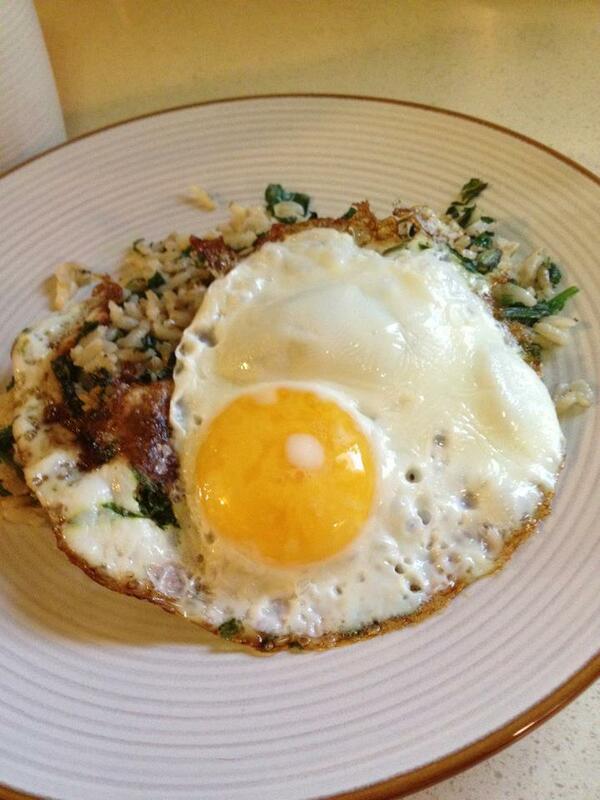 For a change, try a sunny side up egg on top instead of the scrambled egg! After last weeks Pumpkin Spice French Toast, I was in the mood for more fall dishes. My daughter requested pumpkin muffins. They have always been her favorite and before going gluten free we use to make them all the time. Now I had to find a healthy, gluten free alternative. I found this pumpkin muffin recipe from Jenni Hulet over at The Urban Poser. It fit all the criteria I needed and were absolutely delicious! 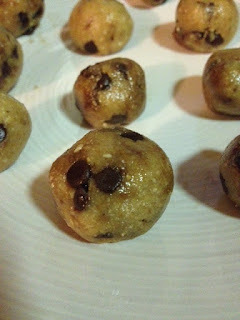 You would never know that they were gluten free and grain free and my daughter approved! I also made these with maple syrup instead of honey and they came out great too! 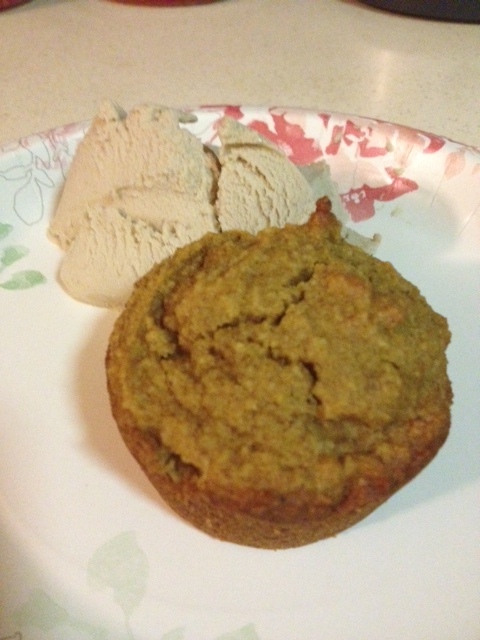 I paired this muffin with this Roasted Banana Coconut Ice Cream from Elana's Pantry. This was also an amazing recipe. I have made some dairy free ice creams in the past and was not satisfied. This ice cream is so creamy and the roasted bananas give it a great flavor. This was also approved by my kids so I know I’ll be making it again! I know that summer is barely over and school hasn’t even started for us yet, but I am getting that excited feeling for fall (even though it is going to be 90 degrees here today!!) 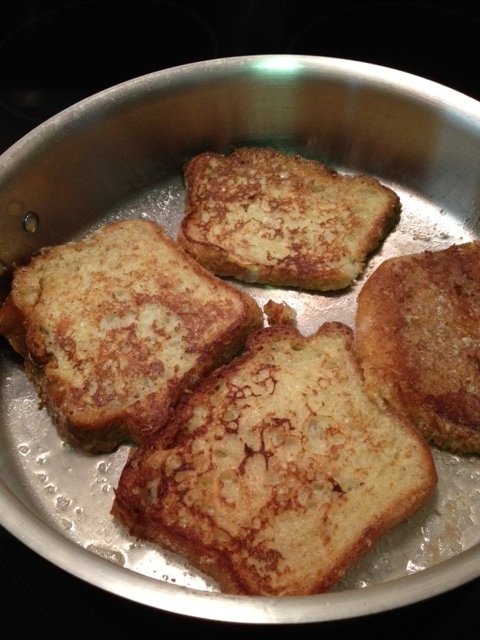 I figured I’d go with my excitment for fall and make Pumpkin Spice French Toast for breakfast. I received my first order of bread from Everybody Eats. 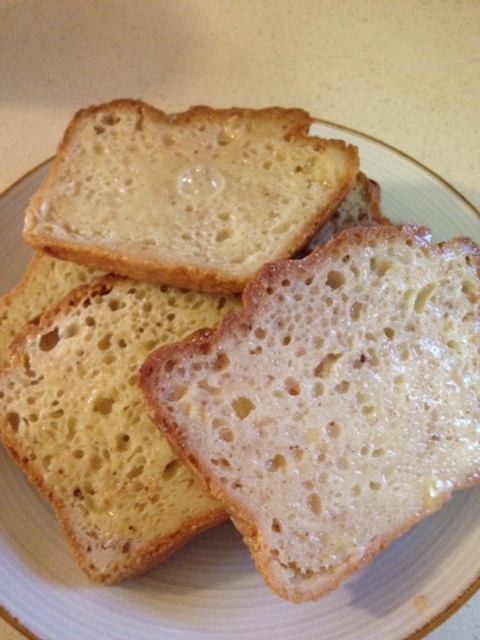 This recipe is made from their Challah Bread which is Dairy Free and Gluten Free. 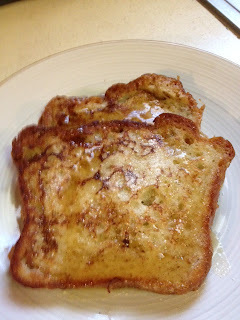 This is the first item I tried and it was amazing, this made the perfect french toast. You would never know the difference between this and regular gluten challah! 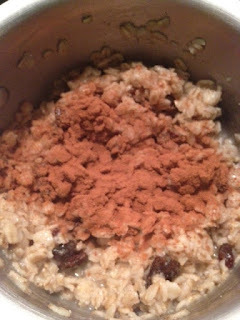 In a large bowl, whisk together the eggs, milk, vanilla, cinnamon and pumpkin pie spice. 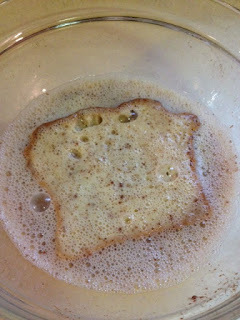 Dip each slice of bread into mixture and then flip over in mixture. Move to a plate. Once all bread is dipped. Preheat a skillet on medium-low with earth balance spread. 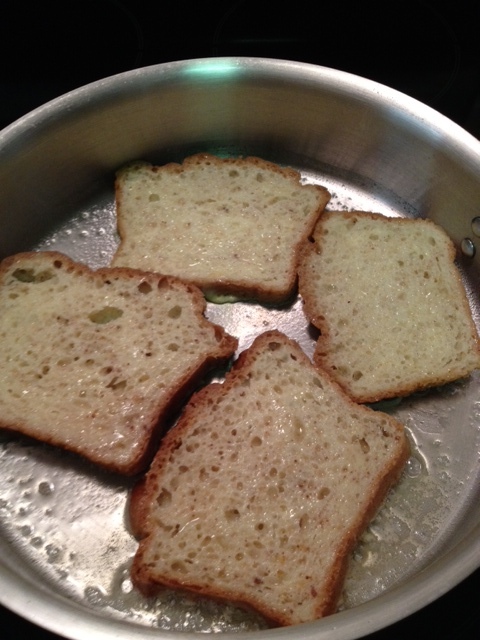 Cook each slice of bread until golden brown. Move to a plate and serve with maple syrup and a sprinkle of Stevia! 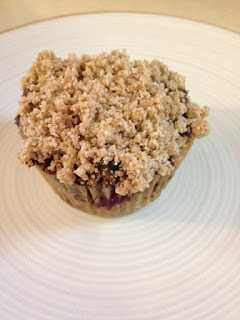 I have been working hard these days trying to make a muffin that is gluten free, dairy free, soy free, refined sugar free but still moist and flavorful like the muffins I remember eating before going gluten free. I finally did it!! This berry crumb muffin is very moist on the inside with a nice crumb topping and is gluten free, dairy free, soy free and refined sugar free! I make my gluten free rice flour blend in batches and keep it in a container and use as needed. This recipe for the flour blend was based on the measurements from Shauna at Gluten Free Girl. I use 700 grams of Brown Rice Flour, 150 grams of Potato Starch and 150 grams of Tapioca Flour. 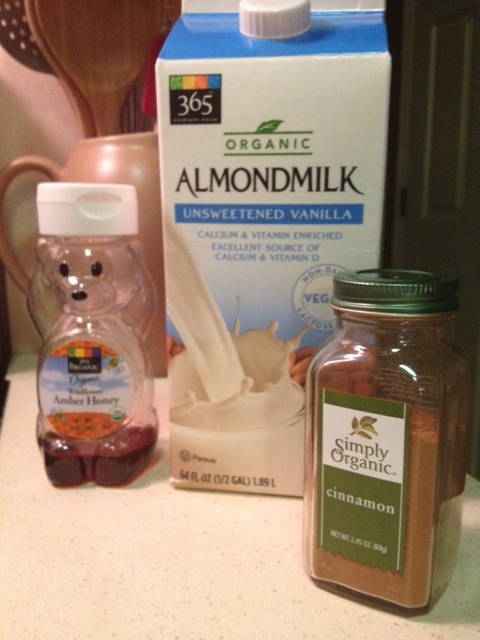 Mix these together in a container and shake it up. Mix almond flour, salt and cinnamon in a bowl. Melt coconut oil over low heat on the stove. Add the coconut oil and vanilla to the flour mixture and mix until crumbly. Set aside. Preheat oven to 325 degrees and line a 12 muffin pan with liners. 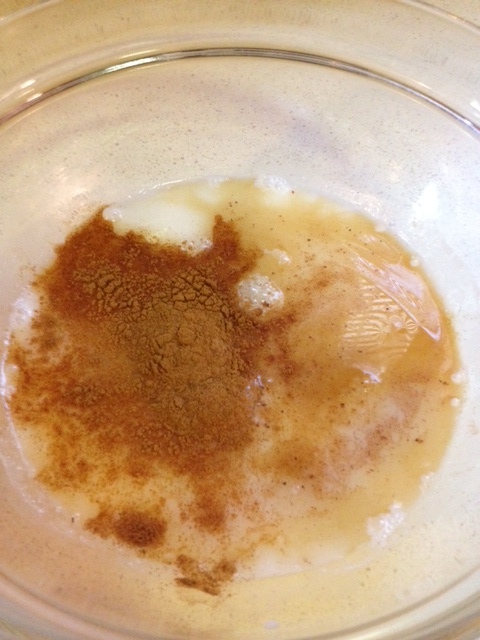 Mix flour, baking powder, baking soda, salt, xanthan gum, cinnamon and nutmeg in a bowl. 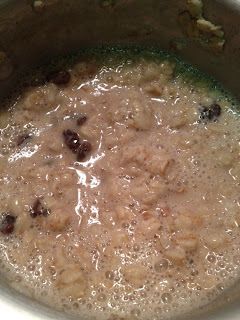 Add the coconut oil, maple syrup, rice milk and vanilla extract and stir to combine. Fold in the mixed berries. Spoon into lined muffin tin. Top with crumb mixture. Bake for 26 minutes at 325 degrees. 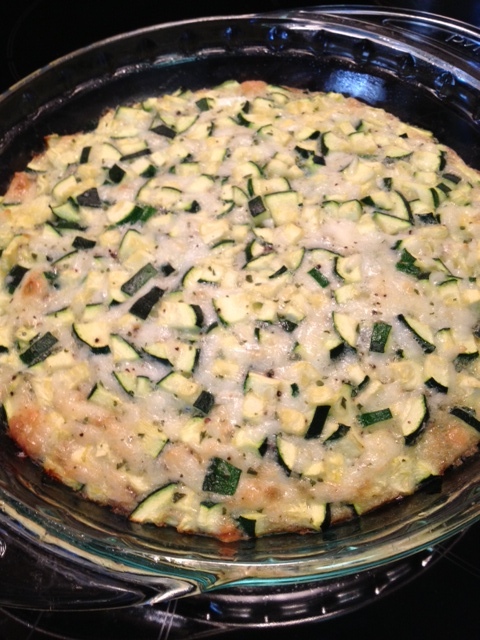 Let cool in the pan for about 15 minutes before moving to a plate to enjoy! I have always loved peanut butter cups and now my children have the same love when it comes to dessert. When I was younger and ate traditional candy, Reeses peanut butter cups were my favorite! Then I became more health conscious and moved on to dark chocolate peanut butter cups, Trader Joe’s were my new favorite. Now, I rarely buy any packaged food. I try to make everything from scratch. 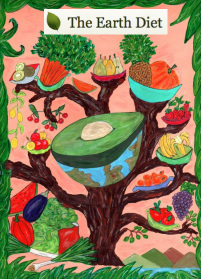 That may seem like a lot of work, but that is why The Earth Diet Book is so great, the recipes are so simple and use the best quality ingredients for your health. 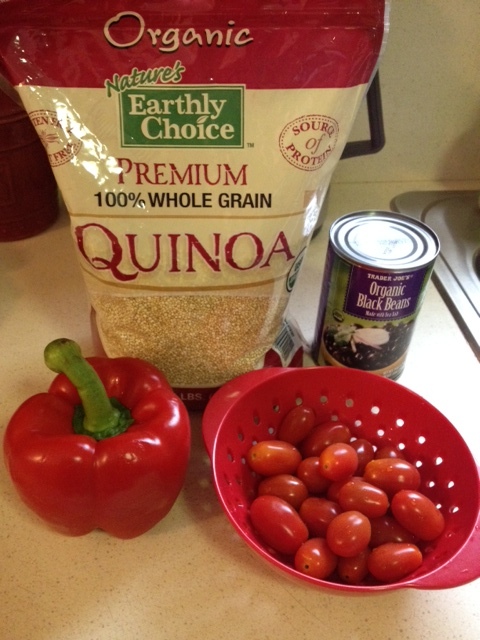 This recipe caught my eye as soon as I received this book from Liana over at The Earth Diet. There is so much information and many good recipes in this book. (I have already made about 5 so far and all have been great!) I suggest anyone looking to eat more raw, simple foods should check out this book! 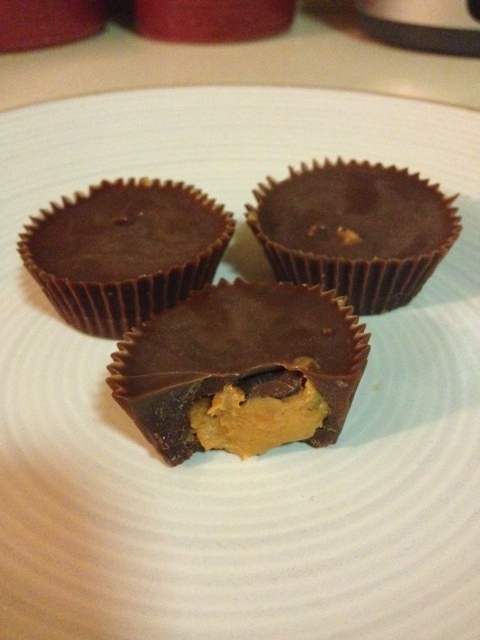 These peanut butter cups were derived from this recipe and the recipe in this book. 1. Lay mini baking cups on a plate. 2. Melt cacao butter on a low heat. Once the cacao butter has melted, turn heat off and add the raw cacao powder and maple syrup. Whisk until combined and smooth. 3. Spoon 2-3 teaspoons of the mix into mini baking cups (each about halfway full) and place in the freezer to set for 15-20 mins. 4. Once the chocolates have set, spoon in half a teaspoon of peanut butter into each baking cup, then top up with more melted chocolate mixture until the peanut butter is covered. 5. Place in freezer for another 15-20 minutes. Take out when chocolate has set and Enjoy! I’ve been starting to eat more raw foods these days. Raw foods are more nutrient dense. When foods are cooked, some of the enzymes, vitamins and minerals are destroyed. I started making more raw desserts for my kids too. These cookie dough bites were a big hit with the kids. 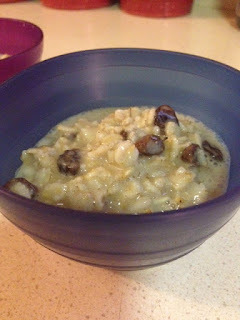 They are also really good mixed into some raw ice cream for a raw cookie dough ice cream treat! This recipe was derived from this recipe from The Earth Diet.